Hey Paisanos! It's the Super Mar that double election prediction you've all be waiting for! ...the Davenport by-election. There are five candidates, all aligned to political parties (if you include the Democrats (which the electoral commission doesn't)). More information on how exactly they plan to achieve this can be found at www.samduluk.com.au/priorities. This is, of course, assuming the Labor majority government allows the Liberals to do these things in the first place. Natasha Edmonds (FFP): A previous Family First candidate in this seat, Ms Edmonds she received 5.1% of the vote among a similar line-up of LIB, ALP and GRN candidates. Family, which unsurprisingly for Family First, is a big priority, is supported through support for adult education, vocational training, support for stay-at-home parents and support for carers. Climate Change (I want to quote directly here so I don't get accused of putting words in mouths where feet should be). has been occurring since time immemorial. Many hundreds of eminent scientists have strongly criticised both the 'climate change doctrine' and the predictions made by the International Panel on Climate Change. Claims that 'there is a scientific consensus' and 'the science is settled' are not true. ... Carbon dioxide has had no discernible influence on the world's climate in the past and there is no reason to believe it should in the future. I know, I know, it's a federal issue, but Family First put it on their state website and this does have potential impacts for the South Australian renewable energy sector, environmental concerns and future development plans. Property Rights (I want to quote directly here, too, because I'm lazy and we still have three parties to get through). provide the foundation on which many other rights and privileges are exercised. The progressive erosion of the rights of property owners through legislation, heritage listing, water restrictions, native vegetation, rising sea levels, zoning and court decisions is significantly diminishing the opportunities for self reliance. Jeanie Walker (DEM): Ms Walker contested the Fisher by-election receiving 0.9% of the primary vote. The Democrats have struggled to get much support after their federal GST backflip in the Howard era robbed them of their campaign basis - honesty and integrity - and saw the Greens become the default third party instead (especially among left-wing voters, with FFP or PUP on the right). Their support has been so low they are no longer listed as a party by the federal or state electoral commissions. Taxation, under the Democrats, would be a system "broadly based, progressive and based on capacity to pay". (Yeah, yeah, I know I'm quoting directly again. Live with it.) They oppose negative gearing, and see tax reform as a means to other political ends, e.g. promoting rural and regional based enterprises, promote the transition to more environmentally benign products and energy sources are encourage the use of public transport. Transport - while we're on the topic - would be improved by upgrading the rail network, building high-capacity monorails, and making the cost of vehicle registration reflect the environmental footprint of the vehicles, all with the intention of encouraging public transport use and reducing green-house emissions. Education, under the Democrats' policies, would include free and universally available child care for 3-4 year olds, free (eventually and/or ideally) university education and a requirement to pass year 12 before being eligible for a full drivers licence to increase student retention rates. Mark Ward (ALP): voting for an ALP candidate has the added advantage that they will hold more sway in getting things done, securing more funding for local projects considering that they are in power, but the disadvantage that they are less likely to fight against government policies that negatively affect the area. Mr Ward is a member of the Mitcham City Council, where he had the benefit of rhyme when encouraging people to vote "Mark Ward for Park Ward". The South Australian Labor Party website is down at the time of writing, so you are spared another list of policies. Until it's fixed, treat a vote for the ALP as a vote for the status quo. Jody Moate (GRN): We're having similar issues with the Greens website. I expect it's a server overload problem as the state checks in en masse prior to the by-election. So, you know, just ease up. I've got a blog to write and you election fiends are crashing the sites. Conveniently, through the magic of Facebook, the Infographinomicon can bring you the Greens policies to the tune of Advance Australia Fair. (Policies in the second verse, around 0:40). Last election the Liberal's won 51% of the primary vote, taking the seat before preferences were distributed. While there is no direct polling for the Davenport by-election available to me, I sense there is little appreciable movement. Nationally the trend is heading away from the Liberals, but a series of factors in SA - most notably the Gillman land deal - has cast a shadow over the House of Labor too. That said, the minor parties don't look likely to do very well. The Fisher by-election may not be a very good source of public opinion given the unusual circumstances of Mr Such's legacy and the Woodyatt candidacy, so the Democrats may do better than 0.9%. That said, they'll fall well short of any real challenge and the FFP won't be far behind; it is ard to see them making a particularly massive improvement on last election's 5.1%. 1973-Preset Liberal (but Independent Liberal briefly in 1985). What's the Difference between a Mini-Bus and the Queensland Labor Party? Queensland is always interesting electorally. For one thing, it doesn't have an upper house, which make the politics strange and the voting simple. For another, the Liberal and National parties are united as the liberal National Party (LNQ). But last year was particularly odd. Of the 89 seats, the Liberal National party won 76. That's over 85% of the seats. Odder still, Labor's share was only part of the remaining 13 - they won 9 of the seats (around 10%), with Katter's Australian party taking two and the last two going to Independents. In 15 of the seats held by the LibNats, the ALP was not even the runner up. Katter's Australian Party (KAP) came second in Beaudesert, Burdekin, Callide, Condamine, Gympie, Hinchinbrook, Lockyer, Nanango, Southern Downs and Thuringowa. Independents came second in Burnett, Maryborough, Nicklin and Warrego. The Greens came second in Noosa. Normally when the greens come second it's in a left-wing seat where the coalition parties don't get a look in and it's just a question of how left-wing the seat ends up. in Noosa, the Liberal National party was still a serious contender, as evidenced by the fact it won, and the Greens still outperformed the ALP. Such a thorough trouncing of a major party is almost unheard of in Australian politics. So what's the difference between a mini-bus and the Queensland Labor Party? The mini-bus has more seats. However, the Liberal premier quickly squandered his popularity the moment he got into parliament - and I do mean into parliament, not into power, because he had not even been elected prior to the election where he lead the Libs to power. Drastic cost cutting and various other unpopular moves has the polling very close. The latest polling data has the Liberal party at 52% on two-party preferred counts, which is within the margin of error of being 50-50. With LNQ 34, ALP 37 and 18 tossups. Normally this would be our baseline to compare predictions against. However, because my predictions are limited to (Number of Seats) x 5% (= 4.45 for Queensland, rounded to 4) I won't let the baseline carry so many wildcards. The KAP is responsible for the bulk of cases where the 2PP vote is not LNQ v ALP. Although the movement is against the Liberals, the KAP primary vote has dropped almost two thirds based on the latest relevant polling (3.5% between Jan 16-18 compared to 11.5% in the 2012 election). Any seats the KAP failed to take last time will be harder than before, and any seat where the KAP was in second place, the ALP could not have been within 10.8% of taking the seat. So all LNQ wins against KAP will be called LNQ for the purpose of the baseline. ﻿Polling for independents is obviously difficult to come by, but it's hard to believe any second-place INDs would drastically increase their vote, especially with a more competitive ALP this time around, so these have been given to the LNQ too. The Greens vote has improved slightly, retaining Noosa as a tossup. This leaves five tossups on the baseline, but I'll allow that because any further changes to the baseline begin to get very complicated and it will no longer reflect the "first glance" data we are trying to quantify and, ideally, beat. At no point has Roy Morgan polling put Campbell Newman above 50% or Annastacia Palaszczuk below 50%. 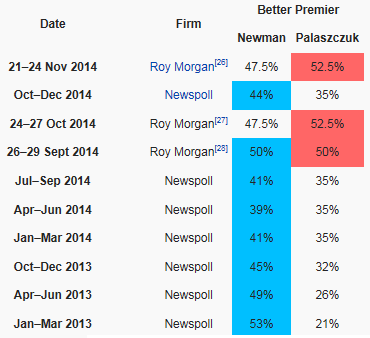 By contrast, Newspoll has never put Ms Palaszczuk over 35% or Mr Newman below 39%. While most of the Newspoll data is earlier than the Roy Morgan polls, the consistency of the Oct-Dec Newspoll with all previous data, in the midst of equally consistent Roy Morgan polling, is far more likely to indicate methodological differences than actual trends in opinion. 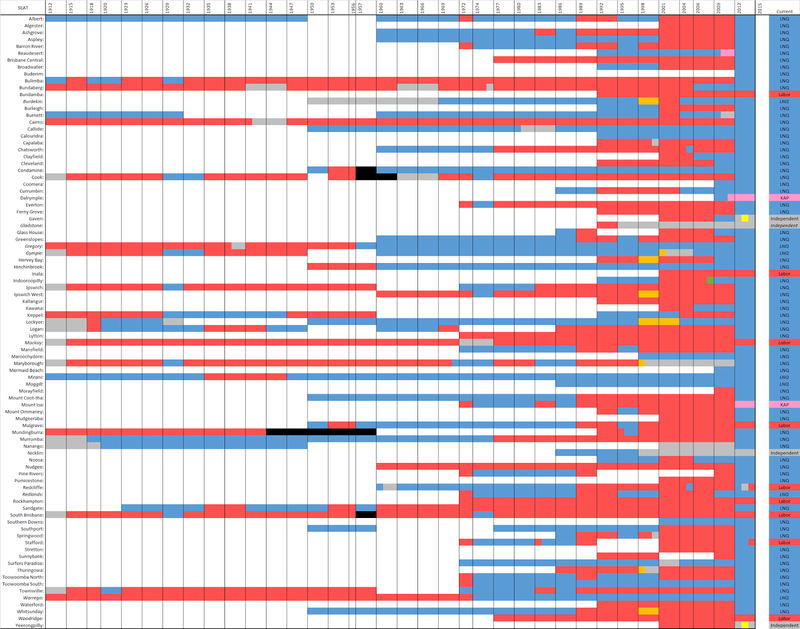 Here's a diagram of each seat's history since the abolition of multiple-member seats before the 1912 election. This allows us to work out which major party a seat normally voted for, and the strength of this support, calculated by (F-A)/T where F is the number of times they voted for that party, A is the number of times they voted for the 2PP opposition and T is the number of elections the seat was contested in. By-elections are ignored for simplicity. This gives a fidelity value between 0 (50-50 split of past elections) and 1 (always supports the same party). This differs from the simple win:loss ratio in that a Liberal seat that occasionally votes for an independent will have a higher fidelity score than one that occasionally votes for Labor. The ALP holds two more seats than the LNQ in this count, and 12 more if we ignore the data from last election as an aberration. We can also weight the results by making each decade count for twice as much as the previous decade, and dividing by the number of elections weighted in the same way. This system ignores last election as it is the only election of the current decade AND is highly atypical. This is potentially catastrophic for any weighted system, giving the atypical result twice the weight of any other data. So, I know we've come a long way round and I'd normally use a data dump for all of these tables, but they're crucial to the flow of this post, but here is the resulting data, with columns for seat﻿ fidelity with and without the 2012 data (the latter only being used for resolving tossups in the former data), the weighted fidelity, and a general summary of the seat's normal political leanings. I only have 2PP results for the last four elections, but the average LNQ:ALP 2PP ratio is 50.35:49.65. Without 2012 the average ratio is 46.20:53.80. It is difficult to work out what a "typical" polling result would look like, but the 52:48 appears, if anything, to be more Liberal National leaning than normal. Let us then call anything on the above summary marked LNQ as safe, While we know anything that didn't leave ALP hands in 2012 is probably not going to any time soon and particularly not this election. Let's also keep the predictions as they are wherever the pendulum/baseline and above summary agree. The predicted swing is in the 20% range, so let's keep any of the remaining spots where the margin is over 15% as a seat retained. When comparing these predictions so far with the fidelity scores, we find we've contradicted a .72 unweighted fidelity for Bundaberg and a weighted fidelity of 1 in Mudgeeraba. Having looked closely at these instances, and in particular the Mudgeeraba issue, and concluded that the fidelity scores are not necessarily helpful; Mudgeeraba was ALP for four elections and LNQ in 2012 which gives it an unweighted (4-1)/5 = 0.6, but weighted value of 1 due to the exclusion of 2012 data. The margin, which had us call it LNQ, is significant (25.93% margin meaning a 75.93% share of the 2PP vote). The fidelity, however, only reflects a recent pattern of ALP favour in an era of strong ALP government. The remaining gaps are filled first by using the pendulum where the fidelity scores give a tossup value, then considering each remaining seat in detail. Additionally, seats held by parties other than the LNQ and ALP are reconsidered (marked !!! in the above table). Broadwater: Held by a margin of 11.29, close to the predicted swing, and with a mixed history but many Liberal victories during Labor's strong victories in the 90s, called LNQ. Burleigh: Identical electoral history to Broadwater, but with a margin of 11.05, called LNQ. Chatsworth: This seat's 13.94 margin belies a strong recent ALP history - 2012 being the first Liberal victory since the 70s. Called ALP. Dalrymple: Held by KAP by a margin of 15.22 is hard to peg down. It is a respectable margin for any party, especially a minor one. I'm tempted to call this for KAP because the candidate won a by-election then held out against the LNQ, suggesting this was not just a 2012 aberration. However, there is no data on how consistent the decline in KAP support is. Tossup. Everton: Like Chatsworth, the margin of 13.15 hides a AP legacy dating back to the 70s. Called ALP. Gladstone: Held by an Independent who is retiring. Won by a margin over ALP despite the oddities of 2012, and the only election not won by an independent was ALP, so that's what I'm calling it. Kallangur: 12.43 margin but historically following the general trend of ALP in the 90s flipping to LNQ in 2012. Probably LNQ again but calling this a tossup. Mount Isa: KAP held by 10.04 since 2012, by a margin over the LNQ despite the recent ALP history of the seat. Could go any of three ways. Tossup. Nicklin: Independent, the margin is only 4.88 over the LNQ but the candidate has maintained an independent tradition started in 1998, and the margin may have been narrowed by the LNQ support last election which will have waned since. Calling this IND. Pumicestone: ALP history in this seat is a result of the party's dominance in the 20s and 2000s. The margin of 12.07 is pretty shaky though. Tossup. That's LNQ 44, ALP 40, IND 1, TOSSUP 4. If the ALP gets the four tossups it's still a hung parliament, with both parties relying on IND support for government. In all probability the split could go either way, so a LNQ government is likely.